DIYMarketers have been using Brand24 for 2 years now. It was awesome to connect with their Founder, Ivana Taylor to learn just why Brand24 is a good fit for their business. "Because DIYMarketers is an online magazine for small business owners -- we use Brand24 a bit differently than other businesses. 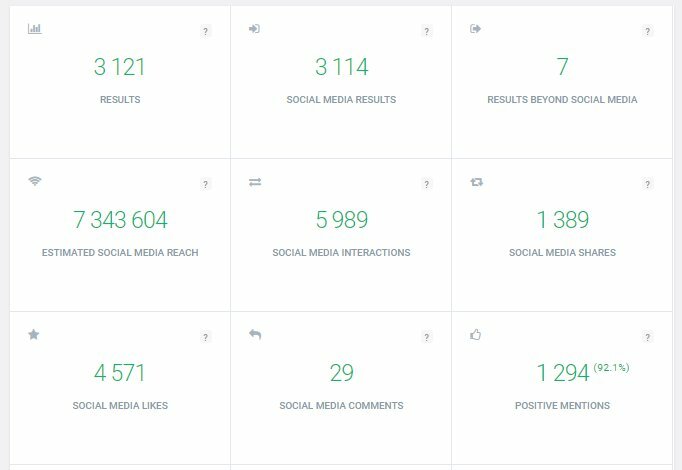 At DIYMarketers, we use Brand24 to track the metrics for our bi-weekly #BizapaloozaChat Tweet Chat. This data is critical as it helps us track how many people came to each chat, how influential those people were, how many tweets were exchanged during the chat and so on. We use those numbers to share with potential sponsors who want to sponsor the chat. The Analysis screen is my regular go to -- this one shows the last 30 days of #BizapaloozaChat performance. I also parse this data weekly so that I can see the trends and if the chat is growing according to plant. Now, most people will want to grow their reach number -- and that's great -- we want that number to go up as well. However, a better number to grow (in my opinion) is the "Social Media Interactions" block. The bigger the number, the higher the velocity of conversation -- it tells me how "energetic" the chat is -- the more tweets exchanged on the hashtag, the better. I also use the "sources" tab to track who attended the chat and how many people attended the chats over the week. Using some basic spreadsheet reporting you can track how frequently people attended. Here's a screenshot of a sample report. We created this report so that we can try and see who was our most frequent attendee - or which attendees were most active in the chat - who was a loyal attendee. While our application is different as a publication -- I can definitely see this being valuable for a company who wants to identify their most active or engaged fans. We are only scratching the surface as far as reporting is concerned -- but this was very useful. Brand24 is an expense for me on the surface. It's a reporting tool that I use and need to use to show sponsors the results of their Tweet Chat results. As a reporting tool, it allows me track and analyze my data and that in turn allows me to get more sponsorship and influencer campaigns. Features or aspects of Brand24 you find most valuable. Aside from the features I've mentioned -- Analysis tabs, sources, etc -- one feature I absolutely LOVE and find super helpful is the "comparison report" -- this allows me to compare #BizapaloozaChat against similar chats and that helps us set pricing -- and also benchmark our performance. Using this data, I can see or select the different elements I may want to focus on in terms of how to improve the chat. Bigger isn't always better -- and this is key. It's not just about impressions and reach (you can blow that number out of the water with 3 influencers who have a 6-figure following) but that doesn't drive conversation or engagement around your brand. You want LOTS of people talking about you - and engaged in a back and forth around your brand. Now -- #TwitterSmarter has that down -- this weekly Twitter chat attracts a lot of people and generates lots of tweets -- AND - it goes VERY very fast and that means that while there is lots of engagement - there may not be deep enough engagement So as we work toward improving our Tweet Chat performance, we want to use this data to get the best of both worlds.